The Chinese in Hawaiʻi constitute about 4.7% of the state's population, most of whom (75%) are Cantonese people with ancestors from Zhongshan in Guangdong. This number does not include people of mixed Chinese and Hawaiian descent. If all people with Chinese ancestry in Hawaiʻi (including the Chinese-Hawaiians) are included, they form about 1/3 of Hawaii's entire population. As United States citizens, they are a group of Chinese Americans. A minority of this group have Hakka ancestry. Chinese immigrant family living in Honolulu in 1893. By 1790, a handful of Chinese lived on the island of Oʻahu, including the 1789 group. They lived together with the chief Kamehameha the Great. Because these Chinese men had not brought any Chinese women along with them, they intermarried with Hawaiian women. They became assimilated and created Chinese-Hawaiian surnames like Akaka, Ahina, etc., in which words of Chinese origin are pronounced with a soft Hawaiian tone. The practice of intermarrying with Hawaiian women continued well into the 19th century, when Chinese women were still a rarity in Hawaiʻi. Most of the Chinese immigrants to Hawaii arrived in the mid-to-late 19th century, when 46,000 people immigrated to the islands. Although many came as laborers for sugar plantations in Hawaii, they concentrated on getting education for their children. When their contracts expired, many decided to remain in Hawaii and opened businesses in areas such as Chinatown. By 1950 most Chinese American men in Hawaii were educated and held good jobs. Today 95% of Chinese Americans in Hawaii live in Honolulu. A significant minority of early Chinese immigrants to Hawaii, and even fewer to the Continental US, were Hakka, and much of the animosity between the Hakka and Punti Cantonese people carried over. 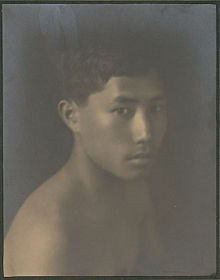 In the first half of the 1800s, around 30 percent of Chinese in Hawaii were of Hakka, while only about 3 percent in the West Coast were Hakka. The largest surge of immigration in that century occurred after an 1876 treaty between the US and Kingdom of Hawaii led to an increased need for labor. The majority of marriages between Chinese men and white women in Hawaii were with Portuguese women. Portuguese and other caucasian women married Chinese men. These unions between Chinese men and Portuguese women resulted in children of mixed Chinese Portuguese parentage, called Chinese-Portuguese. For two years to June 30, 1933, 38 of these children were born, they were classified as pure Chinese because their fathers were Chinese. A large amount of mingling took place between Chinese and Portuguese, Chinese men married Portuguese, Spanish, Hawaiian, Caucasian-Hawaiian, etc. Only one Chinese man was recorded marrying an American woman. Chinese men in Hawaii also married Puerto Rican, Portuguese, Japanese, Greek, and half-white women. There was a communal ban on intermarriages between the two groups for the first generation of migrants. In the middle of the 19th century, Hakka immigrants in America were excluded from membership in the Chinese organizations. Prior to the arrival of Christian missionaries in Hawaii, the early Chinese settlers were adherents of Buddhism, Taoism, and Confucianism. Some even blended aspects of native Hawaiian beliefs into their own belief systems. Today, due to the work of Christian missionaries in the late 19th century and the 20th century, many of the Chinese in Hawaii are adherents of Protestant and Roman Catholic Christianity. Still, about 100 Buddhist and ancestral temples remain. The loyal minority who adhere to traditional Chinese religions pay pilgrimage to their ancestors annually. However, no accurate statistics of adherents within the Chinese community in Hawaiʻi are available. ^ McDermott, John F.; Tseng, Wen-Shing; Maretzki, Thomas W. People and Cultures of Hawaii: A Psychocultural Profile. ^ Carney Smith, Jessie. Ethnic Genealogy: A Research Guide. ^ Margaret M. Schwertfeger (1982). "Interethnic Marriage and Divorce in Hawaii A Panel Study of 1968 First Marriages". Marriage & Family Review. Kessinger Publishing. 5: 49–59. doi:10.1300/J002v05n01_05. ^ Gary A. Cretser, Joseph J. Leon (1982). Intermarriage in the United States, Volume 5. Psychology Press. p. 58. ISBN 978-0-917724-60-2. Retrieved 2010-07-14. ^ Kiang, Clyde. THE HAKKA ODYSSEY & THEIR TAIWAN HOMELAND. Char, Tin-Yuke (1975). The Sandalwood Mountains: Readings and Stories of the Early Chinese in Hawaii. Honolulu: University Press of Hawaii. ISBN 978-0-8248-0305-6. OCLC 1091892. Char, Tin-Yuke (1980). Chinese Historic Sites and Pioneer Families of Kauai. Honolulu: Hawaii Chinese History Center. OCLC 6831849. Char, Tin-Yuke; Char, Wai Jane (1983). Chinese Historic Sites and Pioneer Families of the Island of Hawaii. Honolulu: Published for the Hawaii Chinese History Center by University of Hawaii Press. ISBN 978-0-8248-0863-1. OCLC 255259005. Char, Wai-Jane (1974). "Chinese Merchant-Adventurers and Sugar Masters in Hawaii: 1802–1852: General Background" (PDF). The Hawaiian Journal of History. Honolulu: Hawaiian Historical Society. 8: 3–10. hdl:10524/132. OCLC 60626541. Char, Wai J.; Char, Tin-Uke (1988). Chinese Historic Sites and Pioneer Families of Rural Oahu. Honolulu: Hawaii Chinese History Center. ISBN 978-0-8248-1113-6. OCLC 17299656. Dye, Bob (1997). Merchant Prince of the Sandalwood Mountains: Afong and the Chinese in Hawaiʻi. Honolulu: University of Hawaii Press. ISBN 978-0-8248-1772-5. Glick, Clarence E. (1980). Sojourners and Settlers: Chinese Migrants in Hawaii (PDF). Honolulu: Hawaii Chinese History Center and University Press of Hawaii. hdl:10125/45047. ISBN 978-0-8248-0707-8. OCLC 6222806. McKeown, Adam (2001). Chinese Migrant Networks and Cultural Change: Peru, Chicago, and Hawaii 1900–1936. Chicago: University of Chicago Press. ISBN 978-0-226-56024-3. OCLC 248159623. Young, Nancy Foon (1973). The Chinese in Hawaii: An Annotated Bibliography (PDF). Hawaii Series No. 4. Honolulu: Social Science Research Institute, University of Hawaii. hdl:10125/42156. ISBN 978-0-8248-0265-3. OCLC 858604. Wikimedia Commons has media related to Chinese diaspora in Hawaii.